While all of the other reindeer wouldn't let Rudolph play any games, the creators of The Recipe Redux are inviting us to join in on a holiday foodie game called "Grab a Book and Cook". The challenge is to grab a cookbook and ReDux the recipe on any page that is a combination of the numbers "2017". While I love my collection of cookbooks and can spend hours drooling over beautifully photographed food, it's not often that I cook an entire recipe from one. Unless it's a baking project or I'm preparing food for a special occassion or others, I usually use them for inspiration and dinners ends up being a riff on a recipe found inside. On the other hand, I do own some cookbooks written by kitchen goddesses, whose recipes I would be crazy to make on the fly without regard for their specific instructions. One such book is My Kitchen Year by Ruth Reichl (her kale and anchovy dish is magic and absolutely shouldn't be adjusted), and the other is the simple, but ever-pleasing Cooking for Jeffrey by Ina Garten. As much as I love Ina, I think I may love her husband Jeffrey, or rather her relationship with Jeffrey more. Their comfortable, easy-going, and fun-loving nature is infectious on the television screen and translates wonderfully onto the pages of her newest cookbook. 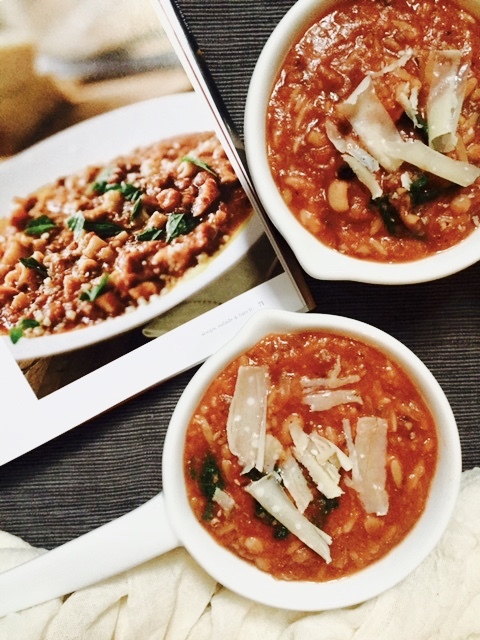 I love her unfussy recipes so much, but found one perfect to ReDux for this wintry challenge. 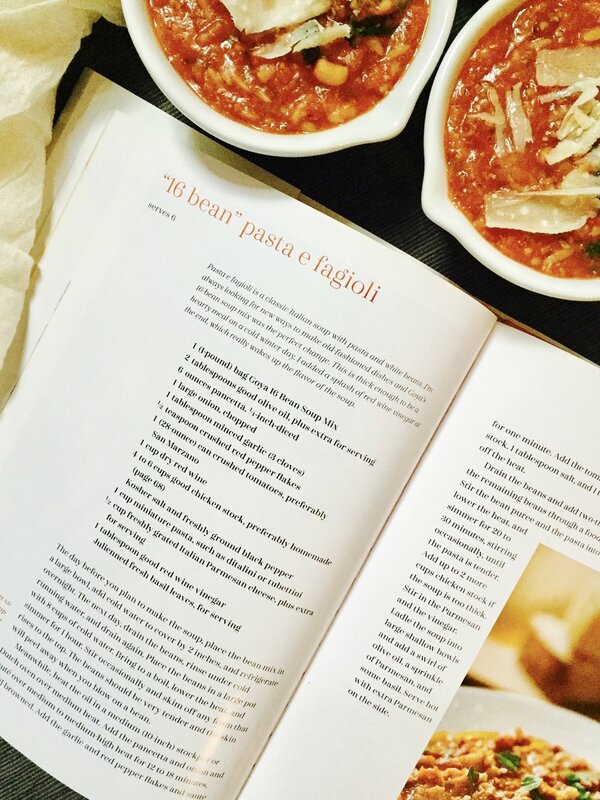 The recipe I chose to ReDux is her "16 bean pasta e fagioli" which can be found on page 70 under the "soups, salads, & lunch" section. 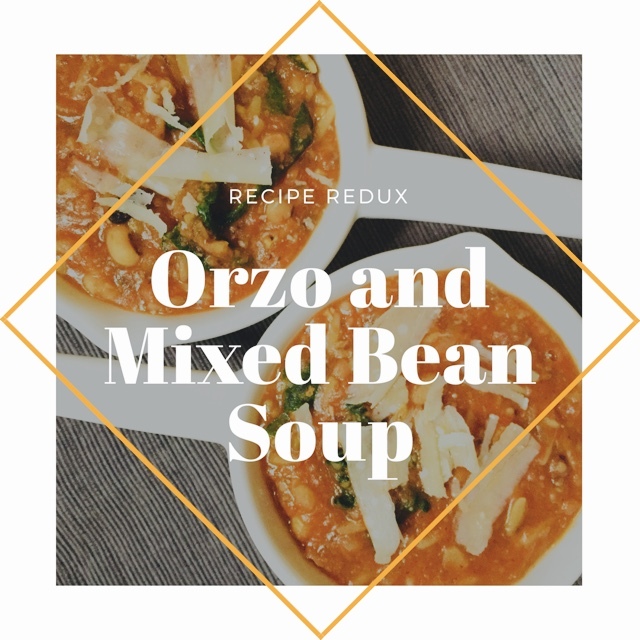 Just as I'll be making some changes to her recipe, she created this soup by using new changes to an old Italian classic, pasta and white bean soup. While her recipe calls for smoky pancetta and chicken stock, I'm turning this thick soup vegetarian by omitting the meat and using vegetable stock. I'm also bumping up the vegetable and fiber factor by tossing in Tuscan kale, also known as lacinato or dinosaur, towards the end of the cooking. The pasta variety I'm choosing to use is orzo because that's what's in my cupboard and it's unlikely I'll use much ditalini or tubettini in the future as I'm going through a serious chickpea pasta phase. The rest of the recipe is too good to change; sweet crushed tomatoes, salty Italian cheese, and a tang of red wine vinegar are ideal winter flavors. I hope you enjoy, and I hope I did Ina proud! Prepare the dried beans one day before you plan to make the soup. Place the beans in a large bowl or pot, add cold water to cover by 2 inches. Refrigerate overnight. The next day, drain the beans, rinse, and place in a large pot with 8 cups of water. Bring to a boil, lower the heat, and simmer for about 1 hour. Stir at times and skim off any foam that comes to the top. The beans should be cooked until very tender. While beans are cooking, heat oil in a large dutch oven or stockpot over medium heat. Add the onions and let cook until browned. Add the garlic, dried basil, and red pepper flakes and saute for one minute. Add the tomtatoes, wine, and 4 cups vegetable stock. Turn off the heat. Drain the cooked beans and add 1/2 to a blender or glass bowl suitable for use with a hand blender. Blend this portion, then add to the soup along with the remaining intact beans and orzo. Bring the soup to a boil, then reduce and let simmer for about 20 minutes until the pasta is tender. If you find the soup becoming too thick, add a bit more stock or water. At the end, stir in the kale, cheese, and vinegar. Take a final taste test and add salt and pepper as you see fit. Ladle soup into bowls and top with a sprinkle of extra cheese and a drizzle of olive oil.